As part of the regional water conservation program the City of Corpus Christi is sponsoring a barrels designed for rainwater harvesting. The barrels are being sold through the city at a price of $47 each plus tax. You do not have to be a resident of Corpus Christi to participate. Purchases are limited to two barrels. There is a limited supply. 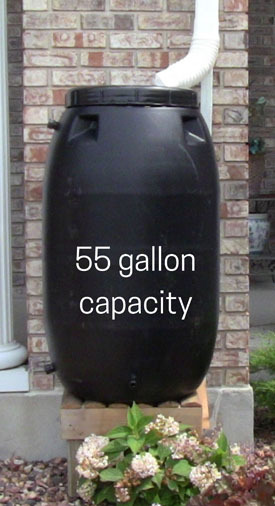 The 55 gallon capacity rain barrels can easily be easily attached to home downspouts and will direct water away from the foundation. They come in one of two colors -- black and terra cotta. The barrels are made of re-purposed or up-cycled BPA-free plastic. They include a childproof locking lid and a bug-proof screen to keep out mosquitoes and other pests. Barrels measure 38" high by 24" wide. They include a value for connecting to a garden hose. Purchases must be made at the Central Cashier window on the first floor of Corpus Christi City Hall, 1201 Leopard St. Then you must pick up your rain barrel at the City Warehouse located at 5352 Ayers Street.